We are dedicated to improving the health of the communities we serve through the provision of high quality, affordable, accessible and culturally appropriate care to all individuals regardless of ability to pay. Health Partnership Clinic is committed to serving as a vehicle for collaboration among community partners as a critical aspect of meeting our mission. People were flocking to the expanding suburb, where development seemed limitless, and schools, business and hospitals were thriving. 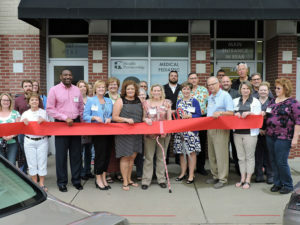 Yet those on the front lines of providing direct community services saw another story: a story of serious unmet medical needs right in the midst of Johnson County’s visible prosperity. That small group of doctors, hospitals and community service providers could see what most others could not: low-income working people who fell through the cracks between public and private insurance coverage. People with critical needs for primary care and no means to pay for it. Many of these people had few alternatives for acute primary care other than the emergency room. Their chronic conditions went completely unaddressed. United Community Services of Johnson County documented the need in 1990 and presented a proposal to the Johnson County Board of Commissioners for addressing it. 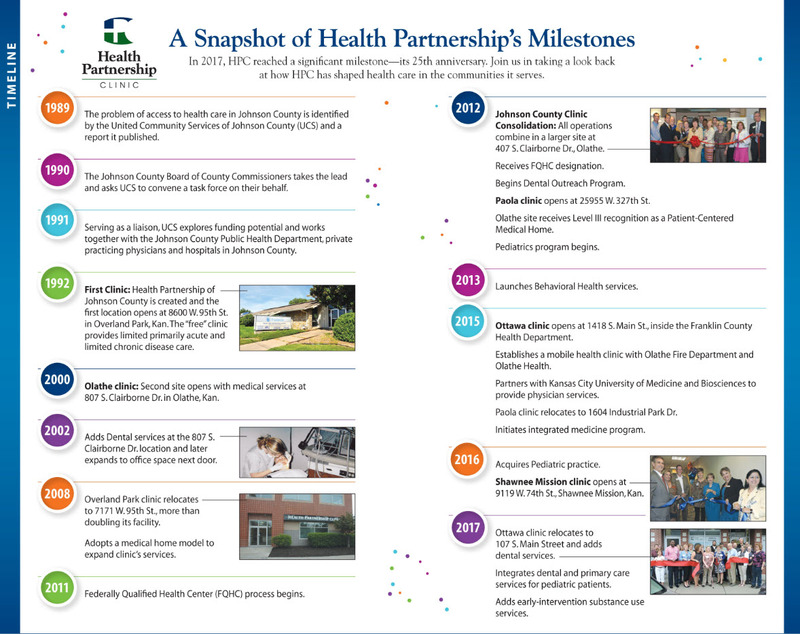 Over the next two years, they collaborated with local physicians, hospitals and other public health leaders to fund and open the Health Partnership Clinic of Johnson County. In 1992, we opened our first clinic, staffed entirely by volunteer physicians, at 8600 West 95th Street, in Overland Park, Kan. Initially, the clinic provided episodic, complaint-based adult primary care, and the hospitals donated imaging and laboratory services. At first, we were serving several hundred of the county’s low-income, uninsured residents at a suggested donation of $10 per visit, and no one was turned away. Over the next 20 years, the clinic would expand to meet the greatest need. We opened an Olathe location in 2000 with medical services. Two years later, dental services were added. Under the direction of Nevin Waters, DDS, the clinic was outfitted with donated mobile dental equipment, and a partnership was initiated with UMKC Dental School. The school provided students on a rotating basis under the direction of volunteer practicing dentists. Thanks to donations, dental services were expanded and moved next door to the clinic. With the addition of three dental chairs, many more patients could be served. In 2009, we entered into a seven-year partnership with Johnson County Community College to provide onsite dental hygiene services by students. Dental care greatly contributed to the explosion in the clinic’s volume and mission. Recognizing the need for coordinated, ongoing care for those with chronic diseases, we adopted a medical home model in 2008. But that wasn’t quite enough. In 2011, our patient volumes soared to nearly 15,000 visits, and we merged the Overland Park and Olathe clinics into a larger space to continue to meet the growing needs. As needs grew and health care reimbursement changes pressured physicians and hospitals, our leaders realized we could no longer operate under the current volunteer model. Board member and attorney Jeff Ellis led us through the process of applying for federal funding. And in 2012, we received designation as a Federally Qualified Health Center. With that came a slight name change to Health Partnership Clinic, a new logo and more expansion in both services and locations. 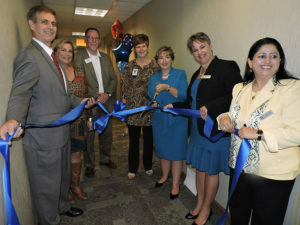 Pediatric care, behavioral health and enrollment services for KanCare and the Health Insurance Marketplace were added. In 2012, a dental outreach program was developed, and today we serve more than 40 outreach locations including Head Start programs, elementary, middle and high schools, mental health facilities, detention centers and health departments. In 2015, we partnered with the Olathe Fire Department and Olathe Health to establish a mobile health clinic. A Health Partnership Clinic nurse practitioner and a firefighter paramedic provide free non-emergency services to Olathe residents. That same year, we entered into a partnership with Kansas City University of Medicine and Biosciences to provide medical leadership and physician services and initiated an integrated medicine program. To address the lack of medical care in nearby rural communities, we added locations in Paola in 2012 and Ottawa in 2015. Our growth continued when we acquired a pediatrics practice on the Shawnee Mission Medical Center campus in 2016. That same year we established a Pediatric Walk-In Clinic at our Olathe site. Our integration efforts were further expanded in early 2017, when we began integrating dental and primary care services for our pediatric patients. In addition, we relocated and expanded our Ottawa clinic, which now provides dental services, added a substance use program for individuals 12 and older and entered into an affordable prescription drug partnership with local pharmacies. Over 25 years, we have grown from a small doctor’s office with volunteer physicians, nurses and staff, to four clinic sites in three counties with nearly 70 employees. Today, we provide nearly 37,000 patient visits annually and serve as a lifeline for more than 15,000 adults and children. We welcome both insured and uninsured patients, and offer a sliding scale for those who qualify based on income and household size. Fifty-eight percent of our patients are uninsured, and 30 percent – mostly children – are on Medicaid/KanCare. From the beginning, the clinic has been built and operated on a foundation of collaboration among community organizations, providers and caring funders. Partnerships remain fundamental to our operations. Among the partners providing both referrals and services to patients are five Johnson County hospitals: Olathe Medical Center, Overland Park Regional Medical Center, Menorah Medical Center, Shawnee Mission Medical Center and Saint Luke’s South Hospital; the Johnson County Department of Health and Environment, Kansas City University of Medicine and Biosciences, Johnson County Mental Health Center, University of Kansas Medical Center, Olathe and Shawnee Mission schools, Kansas Department of Social and Rehabilitation Services, Kansas City CARE Health Clinic, Samuel U. Rodgers Health Center, Catholic Charities, Johnson County Department of Corrections Adult Residential Center, El Centro, Inc., Kansas City’s Medicine Cabinet, area churches, Johnson County Multi-Service Outreach Centers, Center of Grace, Olathe Fire Department and SAFEHOME. Although the percentage of people living in poverty is lower, it’s rising faster in Johnson County than in most other places – affecting 32,440 residents or 5.6 percent of the population in 2016. The percentages in Miami and Franklin counties are much higher. As poverty grows, so does the number of underinsured residents. In the midst of this growing need, we remain committed to our mission of providing an integrated model of medical, dental and behavioral health care and working together with community partners to help create healthier communities.